Acoustics often take centre stage when it comes to the design – or redesign – of any performance venue. 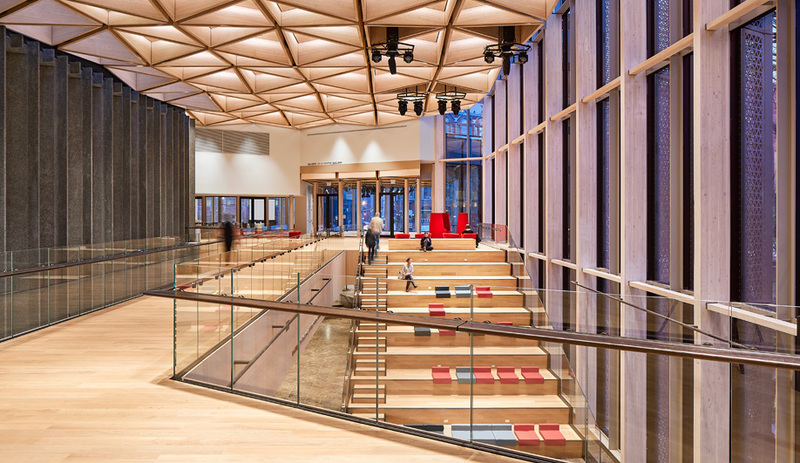 In the case of Ottawa’s recently expanded National Arts Centre, however, sound quality plays a key role in shaping the experience of visitors before they even sit down for a show. 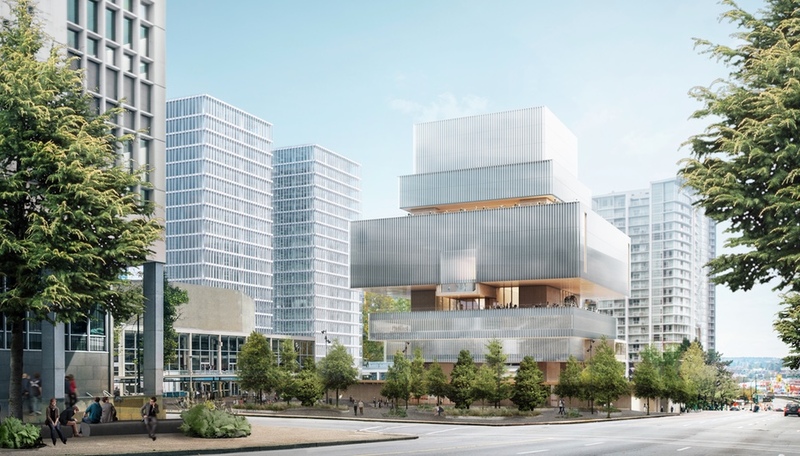 In 2012, Toronto’s Diamond Schmitt Architects, among the foremost designers of performing arts spaces in the world, was commissioned to transform the 1969 brutalist icon into a building that would better engage the public. 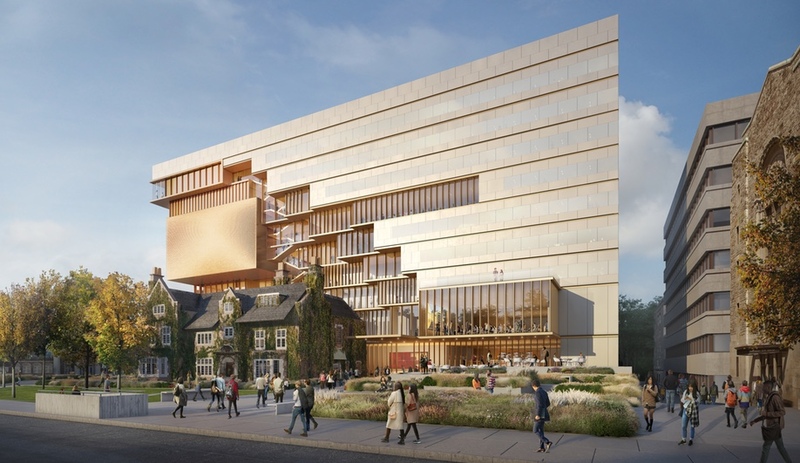 This mandate was addressed first by supplanting the original concrete facade with a glass-panelled one that wraps around existing parts of the building as well as fronting a new north atrium, a double-height space used for pre-concert gatherings, recitals and other private and public events. The second component involved enhancing the sound quality in both the existing performance halls and the new atrium. 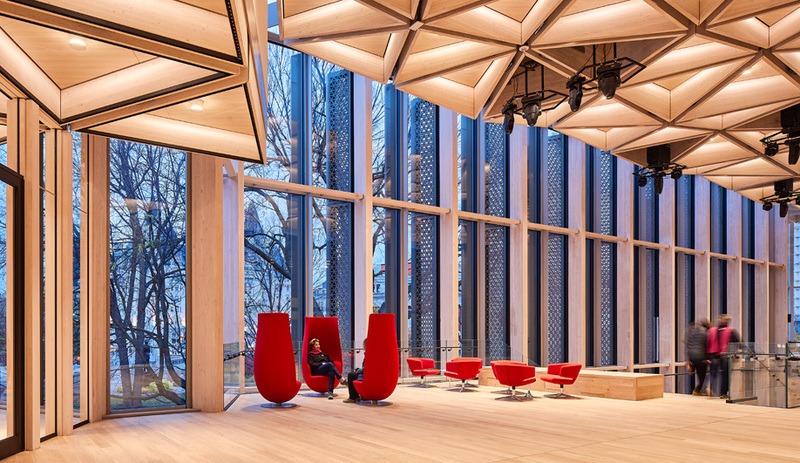 More than 300 identical coffers make up the ceiling of the NAC’s new atrium. Each side of the equilateral triangles is just over three metres long. 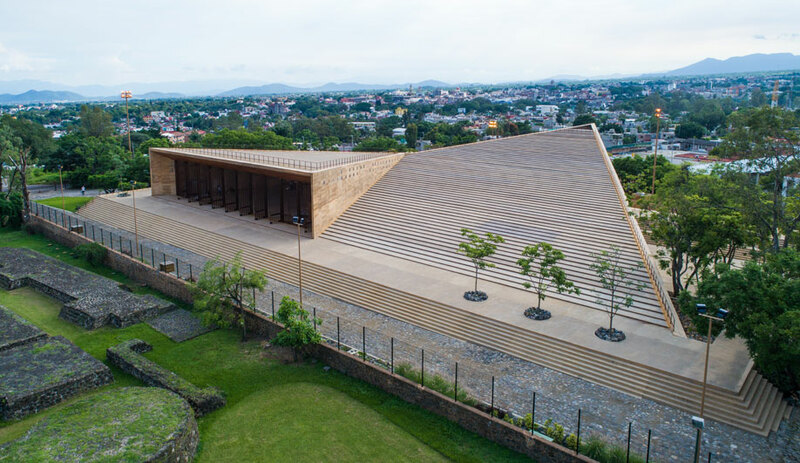 Made of Douglas fir glulam, the coffers are linked by steel plates that were fabricated off-site in linear groups. Each conceals insulation that mitigates noise and tempers the space’s hard surfaces. 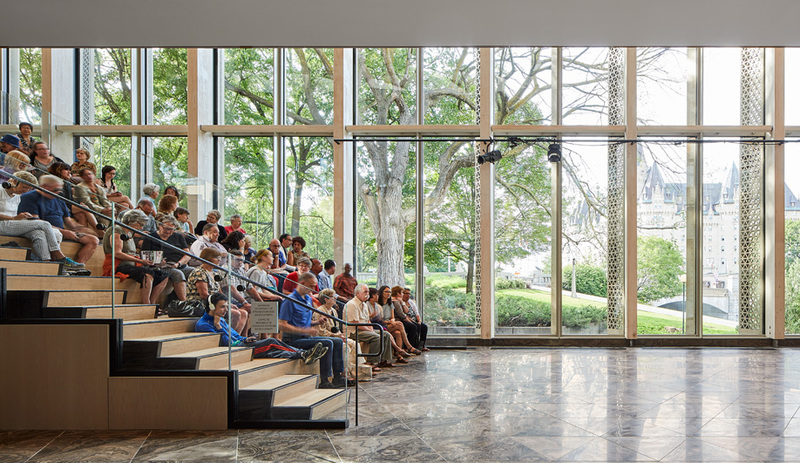 To that end, sound-diffusion panels were incorporated into the atrium’s design with the help of Threshold Acoustics of Chicago. 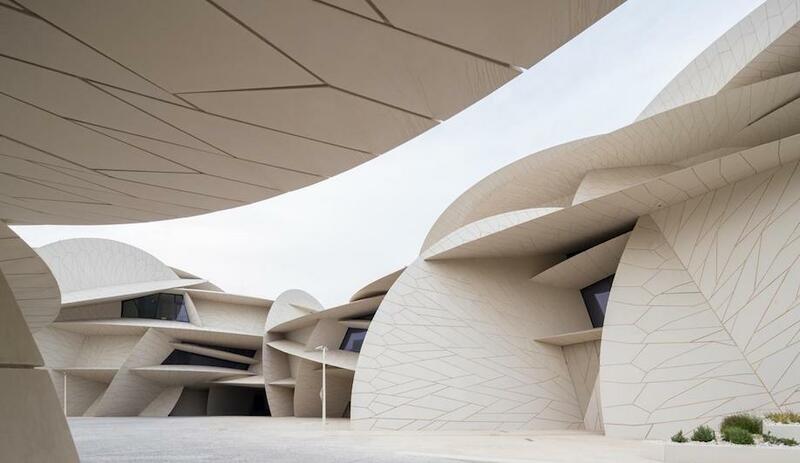 Instead of being discreetly tucked away, though, the panels constitute a key feature of the space: the ceiling, made up of 367 undulating coffers. Each of the triangular coffers is topped with soffits made of micro-perforated laminate by Eomac, a multinational supplier of acoustic wall and ceiling treatments. Above each panel is one inch of semi-rigid insulation for sound absorption. 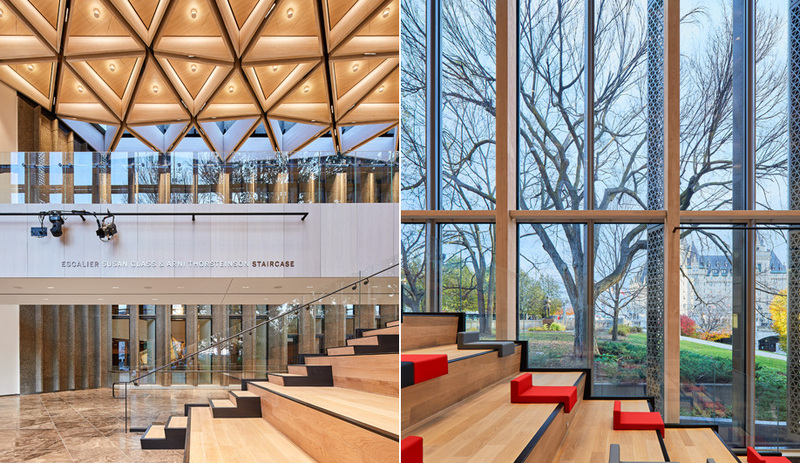 Dramatic as well as functional, the ceiling hovers over new stepped seating, providing the acoustic variability that enables a range of events.